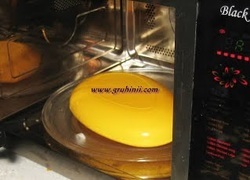 Grease the omelet maker with butter or oil. Break the egg and pour into the omelet maker. Place it in a microwave and cook for 2 mins. Remove and keep it aside. 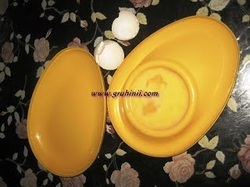 In the same manner prepare the other omelet too. Now Cut the bun to 2 halves. Spread tomato sauce on each half. 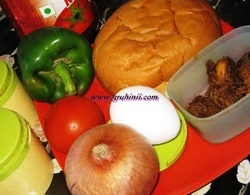 Place finely sliced onions, capsicum and tomatoes evenly on one side of the bun. Place left over chicken pieces. On in place the omelet. Sprinkle salt and pepper powder and close it with the other half of the bun. Now coat with little butter and place it in the Microwave and cook for 2 mins, remove and garnish with fresh mint leaves and sliced onions.